The American Kestrel is the only kestrel species that is native to the North American continent and the Caribbean islands. There is a race of the American Kestrel living in Cuba and this specific race stands out for the fact that it is a much whiter bird in appearance and missing the dotted breast. The kestrels are the smallest falcons seen in North America. 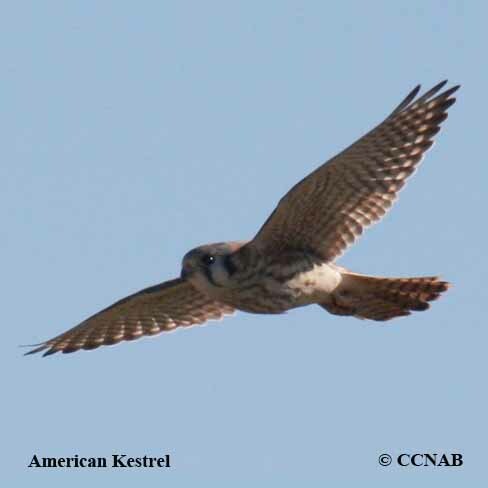 These kestrels can be seen most times perched on utility poles or lines. They can be recognized by their hovering above the ground in farm fields and maintaining one position in the sky, as they search the grounds below for voles and other types of rodents. Not so long ago, the American Kestrel was known as the Sparrow Hawk and even today it is still remembered by this name by some.